Congresswoman Lois Capps and Richard Martinez visited the University of California, Santa Barbara campus and Isla Vista on Monday, Nov. 3, the day before the Nov. 4 midterm elections to urge students to turn out at the polls. 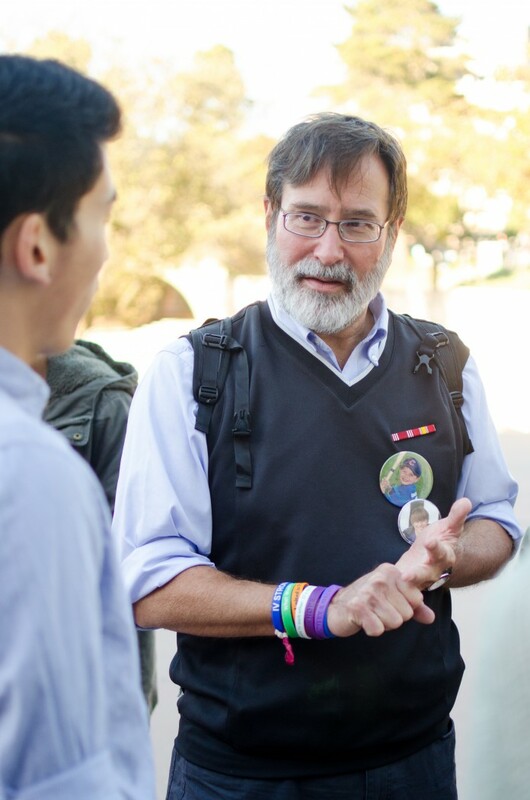 Martinez, father of Isla Vista shooting victim Christopher Ross Michaels-Martinez, joined Capps in front of the University Center to talk to student voters about the important issues either on the ballot or relevant to the campus. “There’s much at stake in the world, and in our nation, and in local communities,” said Capps. “I just think it’s terrific to be associated with a campus like [UCSB] where we’ve had the highest percentage of voting students of any college campus in the country… we don’t want to let that proud tradition down.” School spirit, said Capps, should galvanize UCSB students to go out and vote in the midterms, in addition to the issues at stake. Capps noted that Martinez, who vehemently admonished politicians and gun rights groups in the wake of his son’s death, has been campaigning with her because he sees the value of politicians committed to passing comprehensive gun control legislation. Although there are no major gun control initiatives on the ballot in California, Martinez’s close connection to the tragedy in May is enough of a motivator for him to talk to UCSB students about the importance of voting in an election that has been met with much apathy from the public. “It’s been about five months since Chris died, during those five months I’ve been in 11 states and the District of Columbia, going to places where there are gun violence issues, both in terms of candidates and also in terms of initiatives,” said Martinez. Martinez mentioned the major gun control legislation on the ballot in Washington State, from where he had just returned from campaigning, where a high school shooting left four teenagers dead. The measure, Initiative 594, would make background check mandatory for all gun purchases in the state. Martinez noted that legislation like the one on the ballot in Washington, or the recently passed California State Assembly Bill, AB 1014, which allows a judge to temporarily revoke someone’s access to guns if they have been determined to pose an immediate threat, goes a long way towards making a difference. After speaking with students outside the UCen, Rep. Capps took to Isla Vista to knock on doors and urge residents to vote.